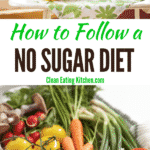 How to Follow a No Sugar Diet - What Can I Eat When Sugar-Free?! If you’re looking to cut back or completely eliminate sugar from your diet, you’ll love this article with how to follow a No Sugar Diet. If you’re worried about what you can eat when on a sugar-free diet, don’t worry! 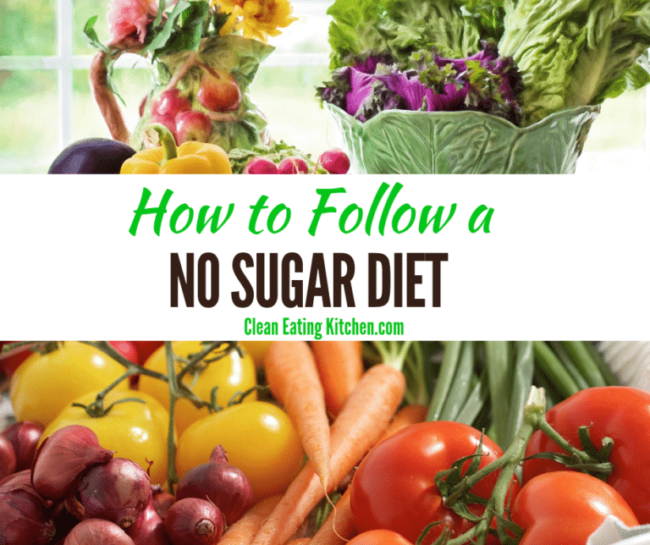 I’ll share tips and meal ideas on a no sugar diet. First, let’s talk about why going sugar-free can benefit health. Sugar consumption is at an all-time high. The average American consumes at least 17 teaspoons of sugar a day, when the recommended amount is ideally about 6 teaspoons for women and 9 teaspoons for men. If you’re following a standard American diet, chances are that you’ll find sugar in nearly everything you eat. Sugar is sneaky, making its way into even savory foods–you likely have no idea how much you’re actually consuming. This is particularly true of processed foods, which often make up the majority of some Americans’ diets. Roughly 39% of Americans are obese, and there’s evidence that sugar is a major culprit. Overconsumption of sugar has a wide and long-lasting array of consequences, many of which we’re still uncovering. Over 50 years ago, the sugar industry played a key role in the demonization of fat as the cause of coronary heart disease. Even though we know that sugar is likely even more of a risk factor for heart disease than fat now, the “low fat” trend is still really popular. Food manufacturers take out fat from packaged foods, but then add in sugar to make the food taste good. The problem with replacing fat with sugar is that healthy fat satiates and is crucial for the majority of the body’s processes, while added sugars have no health benefits, other than contributing empty calories and likely adding to inflammation and disease. Sugar harms our health by sabotaging weight management, increasing inflammation, and leading to addiction. When you consume sugar, whether natural or refined, your body has to go through a variety of metabolic processes. First, your blood sugar levels raise. Your pancreas gets the signal to produce insulin, whose job it is to send the sugar to your cells for use or to be stored as fat. In addition, the constant stress of insulin secretion in response to blood sugar swings from simple sugars plays a key factor in the body’s ability to maintain a healthy weight. When you’re stressed, your body naturally feels unsafe and is more likely to store food as fat in the event that you need glycogen to fuel your muscles (if you’re running from a tiger) or if a famine is on the horizon (if there’s not enough food to sustain health). The dramatic blood sugar spike and drop from consuming sugar can trigger your body’s stress response, which includes an inflammatory response. If your blood sugar is constantly spiking and crashing, you’re experiencing inflammation each time. You’re now in a state of chronic inflammation, which can cause a multitude of issues like autoimmune diseases, Type 2 diabetes, and mood disorders. Most of us try very hard to steer clear of harmful addictive drugs. We know they’re bad for us and that they hijack the body to make us crave them. But if you’re not considering sugar to be one of these addictive drugs–think again! Sugar and sweeteners have a hyperpalatable taste that trigger your brain’s reward center, eventually rewiring your brain to seek out these substances to continue reaping the dopamine rush. So, make no mistake, sugar can be highly addictive. If you think you are addicted to sugar, then you should read my article about how to beat sugar addiction. Being sugar free can mean different things to different people. For some, it may mean no processed sugar, but natural sugar is allowed. For others, it may mean cutting processed sugar and limiting natural sugars as well. And for a few, it may mean no processed sugar, no natural sugar, and no natural sweeteners either (i.e., stevia, monkfruit, yacon syrup). Read more about doing a sugar detox if you want to go cold turkey. For this article, we’ll go with the moderate approach of cutting processed sugar and limiting natural sugars as well. This means limiting fruit to several servings a day or less, and reserving natural sweeteners like honey, maple syrup, or coconut sugar to special occasions. If you’re concerned about what you can eat on a no sugar diet, then rest assured that there are tons of choices. In fact, if you decided to avoid processed foods and just ate whole foods, then you would naturally be close to a no sugar diet. You can check out my clean eating food list for a list of foods that I consider to be part of a real food approach. You might also like my post about how to eat clean without starving yourself. If you want more guidance on how to fill a clean eating plate, then you can get my Clean Eating Meal & Snack Guide here. Also, if you’re going sugar-free, you might want to check out my tips for going sugar-free without going crazy. If you’re going sugar free, a savory breakfast will be your friend! You’ll help reduce sugar cravings by signaling to your brain first thing that sugar is not available. Shoot for at least 25 grams of protein to help keep blood sugar stable. Lunch is a good time to get some antioxidants from fruit, starchy veggies, or natural sweeteners. Paired with plenty of protein and fat, the sugar will be used as energy throughout your afternoon rather than stored as fat. Salad topped with a hamburger patty or sliced sausage and tons of raw shredded veggies. If you went without sugar all day, feel free to pair your dinner with a piece of fruit or a healthy baked treat for dessert. What is the best way to cut sugar out of your diet? Keep in mind that sugar is an addictive substance, so you could be breaking an addiction. Don’t get too hard on yourself if you fall back into old habits. With patience and consistency, you can stop sugar cravings. Moderate: Limit all sugars (natural and processed), but allow healthy treats and indulgences. This approach will look different for every Moderator. As a Moderator, you enjoy having sugar in your diet, and it doesn’t make you crave or obsess over it like you would if you cut it completely. Allow yourself to eat fruit, use honey or maple syrup to sweeten healthy treats, and use stevia or monkfruit on the regular. Abstain: Completely eliminate all sugars (fruit, coconut sugar, sweet veggies) and sugar-free sweeteners (stevia, monkfruit, etc.) An Abstainer may even take it a step further by cutting out hyperpalatable foods or things with a ‘sweet’ taste such as nut butters, coconut, or vanilla. Abstainers know that if they allow anything sweet, the cravings will just continue. Indulge yourself with fat and 100% dark chocolate, but be careful not to label it as a reward. 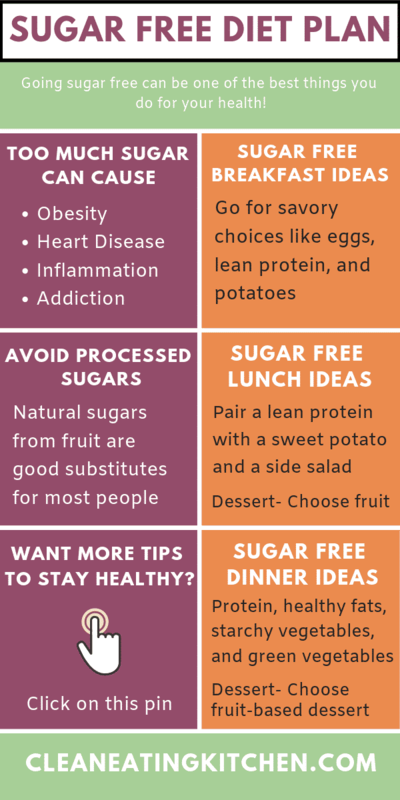 Check out more tips about doing a sugar detox. What foods have no sugar list? Protein (meat, beans/lentils, tofu, seafood) If your protein has been prepared by someone other than you, be sure it has no added sugars. Can you eat potatoes on a sugar free diet? Whether or not you should eat potatoes on a sugar-free diet depends on your reason for the diet. If you are looking to retrain your tastebuds and simply ensure a longer, healthier life, then potatoes are a nutrient-dense food to enjoy. However, if you’re going sugar-free to help balance blood sugar, be mindful of including potatoes too often. Potatoes are relatively high on the glycemic index, meaning that they cause a sharper rise in blood sugar. Someone looking to keep blood sugar stable should focus on protein, fat, and non-starchy veggies. Can you lose weight on a sugar free diet? A sugar-free diet can certainly help you lose excess weight. As described earlier in this blog post, sugar is either used by cells for energy or is stored as fat. Going sugar-free allows your body to use all the sugar it’s given (from starchy veggies or fruit) and minimize the likelihood of any being stored as fat. Moreover, you can lose inflammation weight by reducing your sugar intake. I am definitely needing to cut sugar from my diet (or at least cut back). Your article was very informative and has great advice. Thanks for sharing! I’ve never felt better since I stopped eating sugar over a year ago. I also lost 60 lb! Wow, that’s incredible Karen. Congrats on your success!!! This is such a helpful article! I try to do low sugar on a day to day basis, but no sugar would be hard for me! Though I definitely see the benefits. This a very informative and helpful article. Sugar can wreak havoc to the body if it’s not controlled. I can’t wait to share it with my friends. I’ve learnt to stay away from sugar. it wasn’t easy to keep my tongue away from wanting to taste it but it worked eventually. 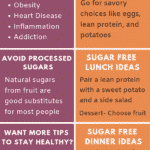 No sugar diet plans are no joke, thanks for these informative tips! I wish you all the best of luck you all have so much more discipline than I do! Thanks for the tips. I definitely need to do this. Hi Karen, I’m so sorry to hear you’re struggling. I have an article specific to sugar addiction coming next week. I know how hard it is, I have been there too. 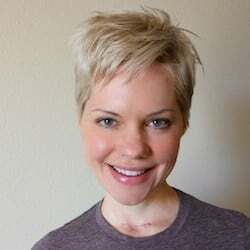 Do you have access to a therapist who could help?